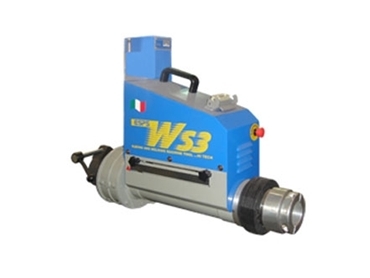 The motorised facing head for WS3 in-situ portable line boring machines available from Precision Metal Group is designed for facing or internal turning jobs on tubular cylindrical bodies. Held on a rotating and translating axis managed by the WS in-situ portable line boring machines, the motorised facing head allows the operator to control all the steps of the machining through an electronic control panel. This enables the radial movement of the tool to be controlled with respect to position and speed allowing for automatic precision machining. Through dedicated modular extensions, different ranges of diameters can be handled and the counterweight can be proportionally set in order to obtain a perfect balanced system. The new motorised facing kit is ideal for orthogonal facing of surfaces and creation of circlip grooves.